Navigation, touch the i (Information) button to access these features. 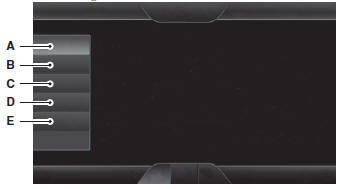 If your vehicle is not equipped with Navigation, touch the corner of the touchscreen with the green tab. SYNC Services requires activation before use. Visit www.SYNCMyRide.com to register and check your eligibility for complimentary services. Standard phone and message rates may apply. Subscription may be required. You must also have the active SYNC Services Bluetooth-enabled cellular phone paired and connected to the system in order to connect to, and use, SYNC Services. See Phone earlier in this chapter for pairing instructions. This feature does not function properly if you have enabled caller ID blocking on your mobile phone. Make sure your mobile phone is not blocking caller ID before using SYNC Services. When you connect, the service uses GPS technology and advanced vehicle sensors to collect your vehicle’s current location, travel direction and speed to help provide you with the directions, traffic reports, or business searches you request. Further, to provide the services you request, for continuous improvement, the service may collect and record call details and voice communications. 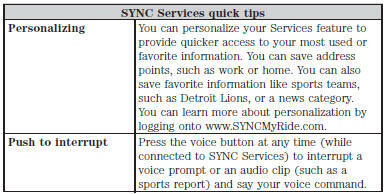 For more information, see SYNC Services Terms and Conditions at www.SYNCMyRide.com. If you do not want Ford or its service providers to collect your vehicle travel information or other information identified in the Terms and Conditions, do not subscribe or use the service. SYNC Services uses advanced vehicle sensors, integrated GPS technology and comprehensive map and traffic data, to give you personalized traffic reports, precise turn-by-turn directions, business search, news, sports, weather and more. For a complete list of services, or to learn more, please visit . 1. When prompted, say “Services”. This initiates an outgoing call to SYNC Services using your paired and connected Bluetooth-enabled cellular phone. 2. Once you connect to the service, follow the voice prompts to request the desired service, such as “Traffic” or “Directions”. You can also say, “What are my choices?” to receive a list of available services from which to choose. 3. Say, “Services” to return to the Services main menu or for help, say, “Help”. 1. Select Connect to Services to initiate an outgoing call to SYNC Services using your paired and connected Bluetooth-enabled cellular phone. 1. 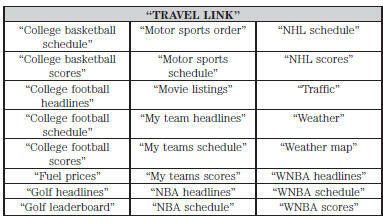 When connected to SYNC Services, say “Directions” or “Business Search”. To find the closest business or type of business to your current location, just say “Business Search” and then “Search Near Me”. If you need further assistance in finding a location, you can say “Operator” at any time within a Directions or Business search to speak with a live operator. The system may prompt you to speak with an operator when it has difficulty matching your voice request. The live operator can assist you by searching for businesses by name or by category, residential addresses by street address or by name or specific street intersections. Operator Assist is a feature of your SYNC Services subscription. For more information on Operator Assist, visit www.SYNCMyRide.com/support. 2. Follow the voice prompts to select your Destination. After the route download is finished, the phone call automatically ends. If your vehicle is not equipped with Navigation: • Turn-by-turn directions appear in the information display, in the status bar of your touchscreen system and on the SYNC Services screen. You also receive driving instructions from audible prompts. • When on an active route, you can select Route Summary or Route Status using the touchscreen controls or voice commands to view the Route Summary Turn List or the Route Status ETA. You can also turn voice guidance on or off, cancel the route or update the route. If you miss a turn, SYNC automatically asks if you want the route updated. Just say, “Yes” when prompted and the system delivers a new route to your vehicle. If your vehicle is equipped with Navigation, SYNC Services downloads your requested destination to the navigation system. The navigation system then calculates the route and provides driving instructions. See the Navigation system section for more information. In order to use Sirius Travel Link, your vehicle must be equipped with navigation and your navigation SD card must be in the SD card slot. A paid subscription is required to access and use these features. Visit www.siriusxm.com/traffic# and click on Coverage map and details for a complete listing of all traffic areas covered by Sirius Travel Link. Neither Sirius nor Ford is responsible for any errors or inaccuracies in the Sirius Travel Link services or its use in vehicles. 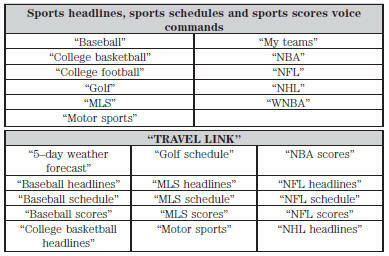 When you subscribe to Sirius Travel Link, it can help you locate the best gas prices, find movie listings, get current traffic alerts, view the current weather map, get accurate ski conditions and see scores to current sports games. Touch these buttons to identify traffic incidents on your route, nearby your vehicle’s current location or near any of your favorite places, if programmed. Touch this button to view fuel prices at stations close to your vehicle’s location or on an active navigation route. Touch this button to view nearby movie theaters and their show times, if available. Touch this button to view the nearby weather, current weather, or the five day forecast for the chosen area. Select Map to see the weather map, which can show storms, radar information, charts and winds. Select Area to select from a listing of weather locations. Touch this button to view scores and schedules from a variety of sports. You can also save up to 10 favorite teams for easier access. The score automatically refreshes when a game is in progress. Touch this button to view ski conditions for a specific area. Note: In order to use Sirius Travel Link, your vehicle must be equipped with navigation and your navigation SD card must be in the SD card slot. If your vehicle is equipped with Navigation, touch the i (Information) button to access these features. If your vehicle is not equipped with Navigation, touch the corner of the touchscreen with the green tab. Press Alerts, and then choose from any of the following services: • View the message. This screen displays any system messages (such as an SD card fault). Note: The system alerts you to any messages by turning the information icon yellow. After you read or delete the messages, the icon returns to white. Press Calendar. You can view the current calendar by day, week or month. Unless the 911 Assist setting is set on before a crash, the system will not dial for help, which could delay response time, potentially increasing the risk of serious injury or death after a crash. Do not wait for 911 Assist to make an emergency call if you can do it yourself. Dial emergency services immediately to avoid delayed response time, which could increase the risk of serious injury or death after a crash. If you do not hear 911 Assist within five seconds of the crash, the system or phone may be damaged or non-functional. Always place your phone in a secure location in your vehicle so it does not become a projectile or damaged in a crash. Failure to do so may cause serious injury to someone or damage the phone, which could prevent 911 Assist from working properly. The SYNC 911 Assist feature must be set on prior to the incident. Before setting this feature on, make sure that you read the 911 Assist privacy notice later in this section for important information. Note: If any user turns 911 Assist on or off, that setting applies for all paired phones. If 911 Assist is turned off, either a voice message plays or a display message (or icon) comes on (or both) when your vehicle is started after a previously paired phone connects. If a crash deploys an airbag (excludes knee airbags and rear inflatable safety belts [if equipped]) or activates the fuel pump shut-off, your SYNC-equipped vehicle may be able to contact emergency services by dialing 911 through a paired and connected Bluetooth-enabled phone. You can learn more about the 911 Assist feature, visit www.SYNCMyRide.com, www.SYNCMyRide.ca or www.syncmaroute.ca. Press Apps > 911 Assist, > On. Settings > Phone > 911 Assist, or • Pressing the Settings icon > Help > 911 Assist. • SYNC must be powered and working properly at the time of the incident and throughout feature activation and use. • The 911 Assist feature must be set on before the incident. • You must pair and connect a Bluetooth-enabled and compatible phone to SYNC. Not all crashes deploy an airbag or activate the fuel pump shut-off (which would trigger 911 Assist); however, SYNC tries to contact emergency services if 911 Assist triggers. If a connected phone sustains damage or loses connection to SYNC, SYNC searches for, and tries to connect to, any available previously paired phone and tries to make the call to 911. Before making the call: • SYNC provides a short window of time (about 10 seconds) to cancel the call. If you fail to cancel the call, SYNC attempts to dial 911. If you do not cancel the call, and SYNC makes a successful call, a pre-recorded message plays for the 911 operator, and then the occupant(s) in your vehicle is able to talk with the operator. Be prepared to provide your name, phone number and location immediately, because not all 911 systems are capable of receiving this information electronically. • Your cellular phone or 911 Assist hardware sustains damage in a crash. • The phone(s) thrown from your vehicle are the ones paired and connected to the system. When you turn on 911 Assist, it may disclose to emergency services that your vehicle has been in a crash involving the deployment of an airbag or activation of the fuel pump shut-off. Certain versions or updates to 911 Assist may also be capable of electronically or verbally disclosing to 911 operators your vehicle location or other details about your vehicle or crash to assist 911 operators to provide the most appropriate emergency services. If you do not want to disclose this information, do not turn the feature on. Always follow scheduled maintenance instructions, regularly inspect your vehicle, and seek repair for any damage or problem you suspect. Vehicle Health Report supplements, but cannot replace, normal maintenance and vehicle inspection. Vehicle Health Report only monitors certain systems electronically monitored by your vehicle and will not monitor or report the status of any other system, (such as brake lining wear). Failure to perform scheduled maintenance and regularly inspect your vehicle may result in vehicle damage and serious injury. Your Vehicle Health Report feature requires activation prior to use. Visit www.SYNCMyRide.com to register. There is no fee or subscription associated with Vehicle Health Report, but you must register to use this feature. This feature may not function properly if you have enabled caller ID blocking on your mobile phone. Before running a report, review the Vehicle Health Report Privacy Notice. Note: Cellular phone and SMS charges may apply when making a report. Register for Vehicle Health Report and set your report preferences at www.SYNCMyRide.com. After registering, you can request a Vehicle Health Report (inside your vehicle). Return to your account at www.SYNCMyRide.com to view your report. You can also choose for SYNC to remind you automatically to run reports at specific mileage intervals. Cellular phone airtime usage may apply when reporting. • Items noted during vehicle inspections by your authorized dealer that still need servicing. If you want to run a report by using the touchscreen, touch Apps > Vehicle Health Report. command, press the voice button on the steering wheel and, when prompted, say “Vehicle health report”. When you create a Vehicle Health Report, Ford Motor Company may collect your cellular phone number (to process your report request) and diagnostic information about your vehicle. Certain versions or updates to Vehicle Health Report may also collect more vehicle information. Ford may use your vehicle information it collects for any purpose. If you do not want to disclose your cellular phone number or vehicle information, do not run the feature or set up your Vehicle Health Report profile at www.SYNCMyRide.com. See www.SYNCMyRide.com (Vehicle Health Report Terms and Conditions, and Privacy Statement) for more information.